Unit studies are different than other forms of homeschooling. How? Often there are no workbooks, worktexts, or fill-in-the-blank sheets to give your child. What happens when your state, or umbrella school, asks for grades? How do you find out what information your child retained? We have an answer for you! Weaver Review Questions Volume 1 will help you test your child on the information they learned while studying the Volume 1 material of The Weaver Curriculum®. Quiz them on Bible material, social studies facts, science information and language skills. But that's not all! The material is divided into grades 1 & 2, 3 & 4, and 5 & 6 to make it easier for you, the homeschool parent, to ask the appropriate questions. No more wondering if your child is 'getting it.' We've given you a measuring stick to assess your child's knowledge. 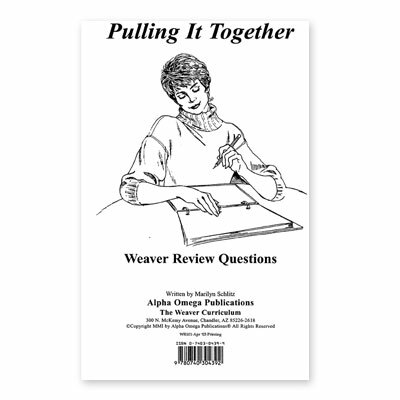 Weaver Review Questions Volume 1 comes complete with reproducible student pages as well as teacher's pages with the answers in bold italics. You can choose to ask the questions orally as an informal review, or give the student the page as a formal test. It's up to you! Directions for figuring grades are also included. Questions are divided by subject. Order Weaver Review Questions Volume 1 from Alpha Omega Publications today, and test what your child has learned!